Once upon a time fruit trees could be found in every New Zealand garden. With today’s smaller gardens it is more difficult to find space, but with careful selection they can fit. Citrus don’t take a lot of space. Without doubt citrus trees are the most popular fruit grown in home gardens. This is not surprising, considering the usefulness of the fruit, the attractiveness of the tree and the ease of growing them. Early Mandarins begin to ripen from early June with oranges grapefruit and lemons holding on until November. This winter-early spring fruiting makes citrus so valuable when other fruit is more expensive. They are also very attractive trees with their glossy green leaves, fragrant blossom in spring and coloured fruit in winter. Citrus will grow in warm or mild climate zones. Providing frosts are not severe they will tolerate cool conditions. They will thrive in hot inland conditions providing they have water. They require a sunny position protected from cold winds. Citrus prefer a sandy or loam soil. They will tolerate clay soils providing they are planted on a raised area with lots of compost mixed into the soil. Citrus are big feeders. A moderately sized mature tree requires at least 500g of General or Citrus Food each year. Two thirds of this should be applied in late winter and one third in January. Pelletised Sheep Manure is a good alternative. Do not cultivate under citrus trees as their feeding roots are relatively close to the surface. A layer of mulch spread over the surface under citrus trees will conserve moisture and improve performance. Take care however, to keep mulch away from the base of the tree trunk. Citrus trees are relatively free of insect pests, but occasionally can be attacked by scale insects, aphids and mites. Yates Mavrik controls all these pests. Citrus tend to be self-shaping and so need little pruning. Lemon trees can sometimes require pruning back to make them more compact and easily manageable. Make sure that any shoots below the graft are removed. These are easily identified as they have different foliage. Citrus fruit on new season’s growth. Meyer variety is most popular because of its reliable high yield over an eight month picking period. The fruit is of medium size and sweeter than other varieties. Lisbon and Eureka are more acid and often preferred by chefs. Yen Ben is an improved selection of Lisbon for those wanting a ‘real’ lemon for cooking. 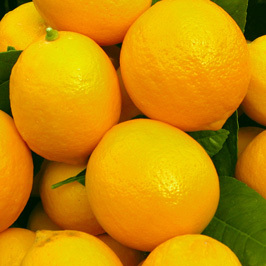 Golden Special is the traditional grapefruit with pale orange skin and a strong grapefruit taste. Excellent for those who like a strong marmalade. Ripens July - Oct.
Small sweet fruit favourite for marmalade and preserves. Showy fruiting shrub. Good for containers. Heavy cropping, mild juicy grapefruit like flavour. Good for refreshing summer drinks. Limes have become very popular in recent years, largely because of the interest in cooking created by the many cuisine programmes on TV. and magazines. Most popular is the Tahitian Lime or selections such as Bears Lime. Kaffir Limes - mainly grown for the leaves, an essential ingredient in Asian cuisine. NZ navel oranges are rated very highly compared to imported oranges for flavour. Carters or Washington navel oranges are reliable in all but the coldest climates of NZ. Harewoods Late - our main commercial Valencia variety producing high yields of juicy, thin-skinned fruit. Good sized grower. Very popular with families because they are great in school lunch boxes due to the easy peal nature of most varieties. Silverhill - a Satsuma selection, is the earliest, ripening (July) and is a very easy peal. Miho - a new early ripening easy peel which begins cropping as a young tree and has more flavour. Encore - excellent flavour, vigorous bush cropping ornamental, firm fleshed, easy to peel fruit. These are a cross between grapefruit and oranges and now only grown by the citrus enthusiast.